I will be the first to confess I love white food. Pasta, yogurt, rice, calamari, cauliflower, potatoes, tartufi bianchi... You could make a meal out of it, and I often do (well, not very often with truffles). But the current wisdom is that eating colorful foods is good for health. Blueberries, carrots, kale, beets. Yum. Not only is it good for you, it's good looking. So it's lucky that the humble, wan, white cauliflower has been sharing market space lately with purple and yellow cauliflowers. I bought a couple of deep yellow ones (the variety is called Cheddar) and subjected them to my favorite treatment: Slow roasting with a generous coating of oil and minced "dark" flavors: olives, capers, anchovy paste, garlic, a little preserved lemon rind and salt, of course. I was surprised by the detectable sweetness of the Cheddar cauliflower. Not as "gassy" flavored as plain old white, it stood up beautifully to the treatment, but now I'm wondering if, next time, I might let the sweetness direct me into new territory, say maybe butter, a restrained dash of baking spices and a handful of walnuts. What the heck, maybe some cranberries too. Keep that colorful, healthy thing going. I've been wanting to try those yellow and purple ones. I didn't realize they had a different flavor. I've only seen them from one vendor at our local farmer's market and I guesstimated one of them would cost at least $6+. But now, I think I have to try them! I wonder if the yellow would be perfect for the "twice-baked" recipe I used last week! I bet it would. Now it's on my shopping list. I love cauliflower. I've never had anything but white, though. Purple is really making me excited! Catherine: I got mine in Pt. Reyes Station. If you haven't been, you should try their Saturday market. But yeah, they're a little pricey. (Not $6, though! Oh, wait; I take that back. That's what I paid for a purple one earlier this year.) I'd say go for it, at least once. They're also less watery than white ones. Cyndi: Yes, and would that be Kalyn's recipe? I hope you find some. Abby: White is still pretty good if that's all you can get. The purple, though... ah. It's like your brain wants it to taste grapey, and -- you almost think it does. Actually, I found someone who wants my bridesmaid dresses! (Only one is baaaad. Ha.) It's one of those charities that takes dresses fixes them up, modernizes them if needed, then gives them away again at this big event. Isn't that cool? Yes, Abby, that's cool. I feel like the Big Bad Wolf for not remembering those charities. I wish I was that organized! yum yum yum yum! when will I learn not to visit you when I'm hungry?? *The Fantastics* the world's longest-running musical. I hoped somebody would notice. I'm glad it was you. Can I trade the white one in my fridge for a yellow, please? It turns out I didn't really want the white one. 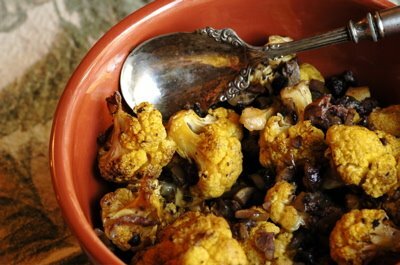 Roasted cauliflower is my favorite way to cook that cruciferous beauty. It mellows and concentrates the flavor. I've had the yellow, I didn't notice anything different about it from the white. But I did discover something the other night. I usually eat cauliflower either raw (with salt) or roasted, I have steamed it but it's. However, the other night I steamed it in the microwave and really liked the results. It tasted closer to raw and held together better than regular steaming. In this case I dressed it with a bit of butter and lemon juice. HAHAHHAHAHHAHHAHAHHAH, and I repeat, HAHAHHAHAHHAHAH. Guess what I had for dinner last night? It's all I had. Roasted cauliflower. I've done 2 or 3 posts for Meathenge on the subject and am always more than pleasantly pleased. Last night was no different. It's so good, it's like meat. ps - I slow roasted mine at 450. Expect details soon. KathyF: Aw, shucks. Stick with the white one if that's what you have. Kate: I'm not goin' back. Kevin: Er, well, disregard comment above. Maybe I'll microwave! Biggles: Why are they so good? Looking forward to your post. I have NO fricken idea, truly. I don't understand fish or veggies. But when you roast those at 450 for about 30 to 35 minutes on the bottom of a huge, flat bottomed turkey roasting pan with extra virgin, s&p, half mooned onions and mushrooms? Egads, words can't describe. The caramelization of the ... everything. I haven't had a vegetable that I can eat instead of meat. This does it for me. I believe what's nice is the high heat poofs the moisture, then browns. What you get is concentrated caramelly everything. White foods, huh? I've always been about a color mix on my plate. Oh, and it looks like I'll probably be heading to Pt. Reyes this weekend. You can try to convince me that cauliflower is yummy. I'll drop you an email later in the week. Biggles: To admit to being perfectly narrow-minded, it hadn't occurred to me to put mushrooms in with the cauliflower. Oh boy, a new thing to try. To infinity... and beyond! Purple is that edible?? I thought it was decorative.Maybe I'll decorate my tummy. Yeah, huh. I put them in cause I had them and they needed to be used. But as an after thought, it made a lot of sense considering what roasted murshrooms can do for flavors and textures.